Commit messages are important. They are a means of communication with yourself and your team throughout the life of your codebase (remember that team members are likely to come and go over time.) In fact, given that they live alongside the code, they’ll probably be the best source of documentation that you have about the evolution of your codebase. 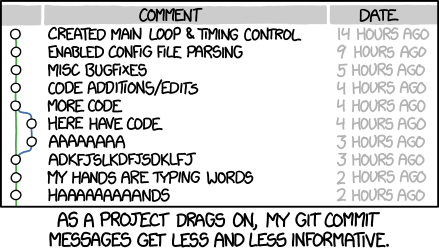 Commit messages are important! Before we consider what good commit messages look like, how about bad ones? I’d argue that look-elsewhere messages are actually a subset of uninformative messages - they are not informative themselves, but rely on a separate source of information which may or may not be available at time of reading. I’m not suggesting that you shouldn’t include a reference to an issue tracker or other work management system, just that this is not enough on its own. That said, it should be obvious that ask Person X is never acceptable! A good commit message should tell the reader, why the change was necessary, how the change addresses that need, and any side-effects the change will introduce2,3. I also like to make sparing use of some basic Markdown sugar, particularly backticks for short code snippets (e.g. class, method or function names), and hyphens for creating bullet lists. These don’t reduce readability in an ASCII context, and really come into their own when reviewing code or pull-requests in GitHub. You should though, save your emojis for Slack, and your ascii art for application boot banners! I tend to use a single line view of the Git commit history (like the one you get in IntelliJ or from the command git log --oneline --graph) quite a lot, so for me the rules about the subject line are the really important ones. Seven simple rules; we could all remember to follow those, right? Oh, OK we can set ourselves a timely reminder with some templating. Tim Pope originally set out this template 10 years ago 5. He also gave additional compelling reasons to follow Rule 6. If you plan to introduce a template (and especially if you intend to mandate one), you should have a discussion with your team about any other elements that they feel they need in order to get the most from the git commit history. For example on our team, people felt strongly that having the issue or story number in the summary line helped when carrying out code reviews on large codebases. We also followed the advice of Caleb Thompson 3 and included a full link to the issue tracker in order to disambiguate—in the 18 months that our team has been together, we’ve already used three different tools for tracking work! Another thing that our team felt strongly about was that we needed to include who worked on the commit, so that questions could be directed appropriately during subsequent code review. Normally I wouldn’t advocate adding anything to the message that would already be automatically included in the commit metadata (e.g. author name, list of affected files). However, in this case the available alternative (using the command line --author option or the Author field in IntelliJ’s commit dialogue to add the second member of the developer pair) was considered too clumsy, and still wouldn’t work for mob programming. way it was, and side-effects or other consequences. Open the file ~/.gitmessage, write your template and save. And that’s it! Next time you run git commit from the command line, your editor of choice should pop up pre-populated with your template. Some developers’ workflow consists of very frequent, very small commits in a feature branch, which is merged into the trunk (commonly the master branch in git) using the --squash option when the feature is finished. In this case it might not make sense to include the story link and the motivation for the work in every commit message, especially when you consider that the bodies of the squashed messages are lost when they’re merged. That said, the all important ‘subject’ line is retained by default when you run git merge --squash my-feature-branch, so I think it’s still worth putting in the effort to write these well. That way, when you do come to write your message for that final merge commit, you’ll be presented with a nice neat list of all the small steps that you made on the way to your complete feature. This final merge commit is also the place to include the motivation for the new feature, a link to the issue or user story that describes the desired feature and any other information that the development team has agreed should be included in commit messages. In short this is the commit that should conform to the team template. the important part [of a pull request] is the message. I want to understand what I’m pulling, and why I should pull it. I also want to use that message as the message for the merge, so it should not just make sense to me, but make sense as a historical record too. If your pull requests fixes a bug or adds a feature described in an issue tracker somewhere, you should definitely include a link to that too.